Simon Pegg and Nick Frost became an instant favorite horror duo of many after Shaun of the Dead was released. Who knew they were going to stick together and release a stream of great geek movies, including the awesome Paul—which totally should have been more of a hit than it was. But there’s more horror and sci-fi to be found in their flix Hot Fuzz and The World’s End. 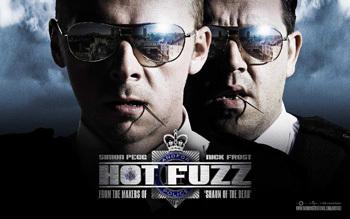 Hot Fuzz seems like a big old cop buddy comedy at first glance, with Simon getting partnered with Nick. But then suddenly, about 1/3 of the way through, there’s someone dressed like the grim reaper with a scythe, and the heads begin to roll—literally! This comedy suddenly has a whole lot of blood, slashing, mutilating, the occult, and corpses in underground tunnels! Just when you think Simon and Nick have landed themselves back in another horror movie…the film becomes an action comedy in the last 1/3! There’s something here to satisfy all kinds of fans—including fans of short-lived James Bond star Timothy Dalton, who has a role in Hot Fuzz. 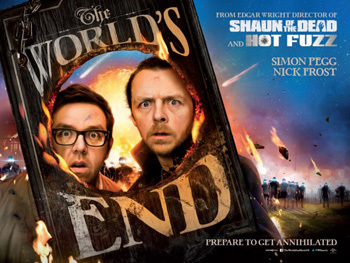 The World’s End is much more of an ensemble flick. Simon Pegg is a slacker who gets his four successful buddies together to do a pub crawl they failed to complete twenty years ago when they were kids. The soundtrack is a total throwback for the graduating class of like 1990/1991, including “Loaded” by Primal Scream, “There’s No Other Way” by Blur, “I’m Free” by Soup Dragons, “Step On” by Happy Mondays, “The Only One I Know” by The Charlatans, “Fools Gold” by The Stone Roses, “Here’s Where the Story Ends” by The Sundays, “This Corrosion” by The Sisters of Mercy, and so much more! The movie starts out like a British version of The Hangover as the guys hesitantly agree to go along. As they hit up the bars, drinking, talking, and fighting, the film feels like it’s going to lose steam—and then comes the first alien robot confrontation! Set the rollercoaster in motion! The World’s End is like a comedy version of 1978 Invasion of the Body Snatchers meets The Stepford Wives. And it totally rox. Awesome fight seasons abound as the guys fend off waves of robot people—while Simon plows ahead to complete the pub crawl and everyone just keeps getting more and more inebriated. Even Pierce Brosnan, another ex-James Bond, joins in on the fun. This entry was posted in Movie Times & Television Schedules - Staying Entertained, Scared Silly - Horror Comedy, The Evil of the Thriller - Everything Horror and tagged aliens, horror comedy, Hot Fuzz, slashers, The World’s End. Bookmark the permalink.